The 2017 employABILITY Expo, held October 12, featuring keynote speaker Randy Lewis, was a sold out event! 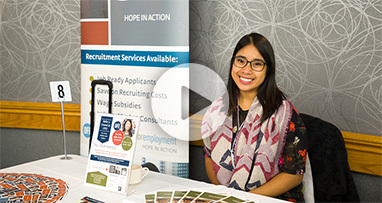 With 20 exhibitors and over 200 delegates, the organizers and host were thrilled with the exchange of information and resulting increase in awareness around hiring people with disabilities in our province. Below are a few pictures of the event. Join us on facebook and check our website regularly so you can Keep Updated with the latest information for the 2018 employABILITY Expo, which will happen during Disability Employment Awareness Month (DEAM).